I haven't been blogging or otherwise communicating online as much as usual lately, for very good reasons. I'm facing two major life crises, simultaneously. As I've been half-joking to friends, if I survive this year I may as well sign up for the Navy SEALs, because it'll be clear that nothing can kill me. The blog of record for what I'm going through is To Hell & (Hopefully) Back. I won't be writing about any of it here, because this is a blog about indie authorship, not coping with trauma. Still, there's one aspect of it that's worth addressing on this blog. As I endure, and one day come to embrace, the changes being thrust upon me, writing will be a key survival tool. Finishing my revisions to The Indie Author Guide and then working with my editor to get the book ready for print will provide me with the much-needed distraction of work, and remind me that I still have something to contribute in the world. Blogging at To Hell & (Hopefully) Back will help me acquire and strengthen the discipline and self-control that will be demanded of me in the coming months and years, to articulate my feelings and share my experiences in a constructive way, and hone what may be my most valuable survival tool: my sense of humor. It will help foster the habit in me of thinking about these difficult times as a necessary, if painful, transitional period that will end someday, and from which I can learn and grow. Pouring my anger and pain into letters that will never be sent will offer an outlet for all the negativity that has to come out, but has nowhere to go. Getting back to work on my author platform in preparation for the release of my book in November will keep me connected to the part of my community that exists apart from what's happening in my personal life, which will keep me looking to future possibilities instead of dwelling on past injuries. It'll give me a place to be the me who's capable and productive. The marketing push I'll need to engineer when the book comes out will offer me a welcome diversion during what's sure to be the most difficult holiday season of my life. If you're a writer, count yourself lucky. You have a crisis survival utility belt that rivals anything the caped crusader's got. Hey, wouldn't it be great if you had a little brother or sister hanging out on the interwebz all day and tattling on anyone who said anything about you or your work online? Then you could quickly respond with appreciation to any kudos, and if it seemed like it would do any good, with damage control to any not-so-kudos. As it turns out, you already do have just such a little tattle-tale, ready and waiting to report back to you. Its name is Google Alerts. 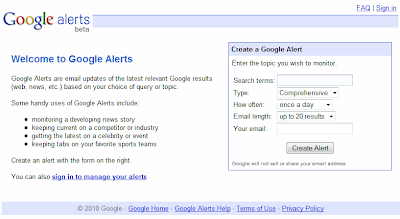 The way it works is simple: you go to the Google Alerts page and set up a separate Alert for each word or phrase you'd like reported back to you. Note that you don't have to have a Google or Gmail account to do this. Under "Type" you can specify whether you want the Alert to search News (news reporting sites), Blogs, Web (non-blog websites), Video (video sharing sites like YouTube), Groups (online communities), or Comprehensive (any mention on any site). Under "How often" you can tell Google Alerts to notify you as-it-happens, once a day or once a week. Anytime the word or phrase you've specified turns up online, Google Alerts sends you an email with a link to the page where the mention occurred. For "Email length" you can choose an upper limit of 20 results or 50 results per email notification. Then you just enter your email address, click the Create Alert button, and your personal tattle-tale is on the job. What Alerts Should Authors Have? my Alert will only include references to the entire phrase, "Author Workshop Cruise". Alerts based on general search terms will return a lot of false positives even when you employ quotation marks, but it can't be helped in some cases. For example, I've set up an Alert for ' "Snow Ball" + novel ' to be notified anytime my novel Snow Ball is being bandied about online, but I also get a lot of hits from people who are talking about about actual balls of snow. Still, I'd rather scan through a few false positives each day than stay in the dark about it when people are talking about my book. When an Alert notifies you of a positive mention, go to the site and see if comments are enabled. If they are, leave a note of thanks to the post's author, along with any additional remarks you can offer about the article, discussion topic, or post in question. Be sure to check off the "be notified of any responses" box, if there is one, so if anyone replies to your comment you'll be notified and can come back to respond. Also be sure to spread the word by sharing a link to the page whenever appropriate. This is a win-win that rewards the person who mentioned you or your work by driving traffic to their site, and strengthens your author platform by demonstrating that people are saying nice things about you or your work. You will be amazed at what a big impact your response and publicity can have on the people who've mentioned you or your work. They will feel validated and appreciated, and will be that much more likely to sing your praises whenever the opportunity arises. So head on over to Google Alerts and get your personal tattle-tale on the job right away!